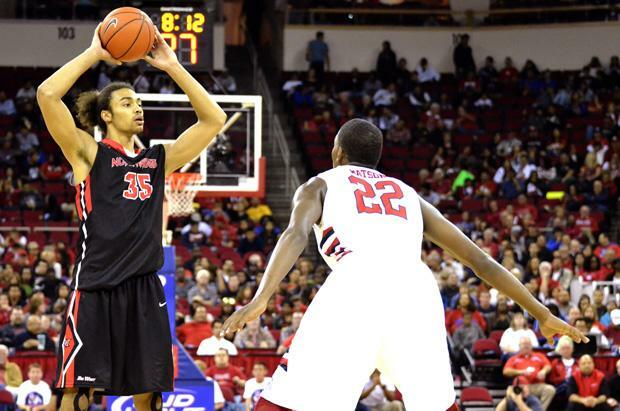 The Matadors (2-5) were blitzed by a huge run for a second straight game and fell to the Utah State Aggies (5-1) 75-67 on Saturday night. CSUN held their biggest lead of the game when junior guard Janae Sharpe scored a layup in traffic after almost fumbling away the ball, putting the Matadors up eight with 13:43 left in the first half. But the Aggies put together a 19-2 run in the next seven minutes and never looked back. Junior guard Cinnamon Lister led Northridge in scoring with 18 points on 6-16 shooting while junior center Camille Mahlknecht notched her first double-double of the season with 11 points and 12 rebounds. Senior guard Jennifer Schlott had a game-high 27 points and added seven assists for Utah State. With the Aggies down six in the first half, Schlott drilled a step-back three, pulling them to within three. Then sophomore guard Makenlee Williams decided to join the three-point party and knocked down two straight bombs from downtown, giving Utah State a 27-24 lead. CSUN could not do much to stop the Aggies after that, only scoring seven points the rest of the period. The Matadors trailed the Aggies 45-31 at the half. Schlott dominated the first half for Utah State, scoring 18 points and making two 3-pointers. Sophomore center Bernadette Fong felt a lack of execution contributed to the first half woes for the Matadors. The second half started with a three-point shot by junior guard Ashlee Guay, who scored all of her14 points in the second half, which cut the Aggie lead to 11. But Utah State blew open the game with a 9-2 run that resulted in a 54-36 Utah State lead with 15:33 left in the contest. 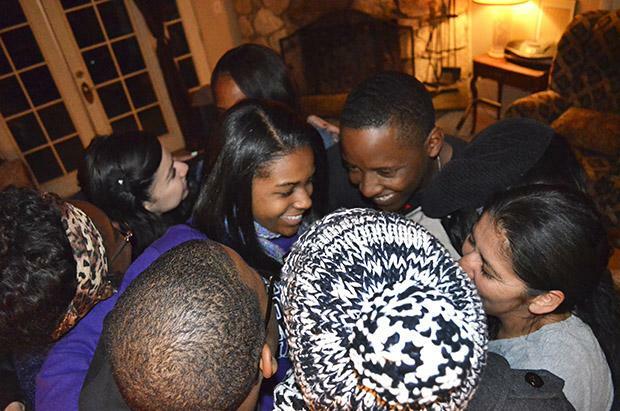 But CSUN would not go quietly into the night. Guay knocked down one of her four second-half three-pointers, igniting a 14-2 Matador run punctuated by a Fong putback off a Lister miss. Fong was fouled on the play and made the free throw, cutting the CSUN deficit to only six with 9:26 remaining. After three Utah State free throws and another Guay three pointer, Schlott stole the ball and converted an easy layup. That started a 9-2 Utah State spurt capped off by five straight points from Williams and another layup by Schlott, sealing the win. The Matadors struggled against Utah State’s aggressive trapping defense, committing 12 turnovers in the first half and 20 for the game. The Aggies ran at every possible opportunity as a result, scoring 17 fast break points to CSUN’s zero. “Most, if not all, of [Utah State’s fast break points] came off of our turnovers,” Flowers said. Mahlknecht thought her team was close to a come-from-behind victory. The Matadors took last place in the Radisson Hotel Chatsworth Thanksgiving Basketball Classic with Saturday’s loss. CSUN also lost their first game of the tournament Friday night against the Santa Clara Broncos, 66-61, after surrendering a 14-2 scoring run late in the game. The CSUN Matadors (2-4) gave up a 14-2 run to the Santa Clara Broncos (2-4) after being up seven late in the game and lost, 66-61. Junior guard Ashlee Guay led CSUN with 17 points and six assists and junior guard Cinnamon Lister chipped in 11 points on 4-12 shooting. Senior center Ruta Zurauskyte had 13 points on 5-7 shooting off the bench for the Broncos. The Broncos late rally started with a layup by sophomore guard-forward Katie Hawkins and an elbow jumper by senior forward Arteivia Lilomaiava to pull Santa Clara within three. After two Santa Clara free throws, CSUN had three chances to score on the same possession, but were unable to do so. On the next Santa Clara possession, Hawkins used a strong post move to score a basket, got fouled and completed the and-one, giving the Broncos the lead. Junior guard Janae Sharpe was able to tie the game at 61 with two free throws of her own, but those would be the last CSUN points of the night. With 48 seconds left, junior guard Nini Gilday scored to put the Broncos up two. On their next possession, freshman guard Montana Walters dribbled at the top of the key and calmly drilled a three-point dagger to ice the game. Guay felt some untimely CSUN turnovers caused Santa Clara’s scoring run. The Matadors shot only 3-21 from downtown, but Flowers seemed unconcerned with the low three-point shooting percentage, pointing instead to defense and turnovers as reasons for the loss. One bright spot for the Matadors was the play of senior forward Mikayla Thielges, who had 10 points, seven rebounds and didn’t miss from the field. It was the first game this season Thielges scored in double figures. The Matadors finish up the Radisson Hotel Chatsworth Thanksgiving Basketball Classic with a home game against the Utah State Aggies Saturday at 5 p.m. in the Matadome. Martha Garcia, a single mother of three, recently moved to back to California from Arizona after things didn’t work out with the father of her four-year-old son, Christopher Caraveo. She currently rents a room in a house owned by a friend’s cousin, and the family has lived there since September while they attempt to get situated. “It’s been a little bit here, a little bit there, but being able to have a place to get on our feet has helped a lot,” Garcia said. 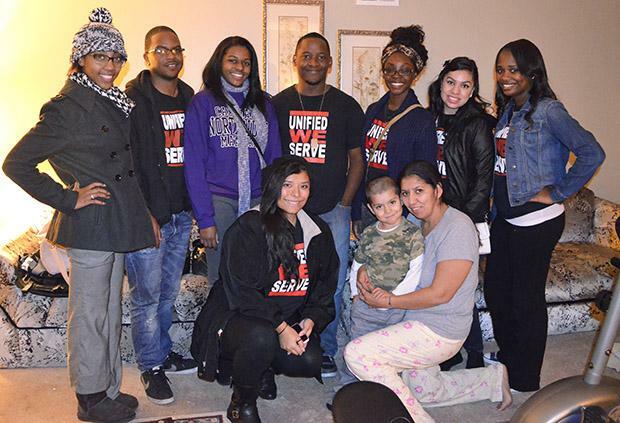 Garcia originally didn’t have plans for Thanksgiving, but that changed Monday night when eight members of Unified We Serve (UWS), a volunteer organization at CSUN, personally delivered food to her and her family at their home. Garcia’s family was chosen through the organization’s Adopt-A-Family program, which chooses families in need and provides them with Thanksgiving food. The program was started five years ago by UWS and works with Meet Each Need with Dignity (MEND), a nonprofit organization that addresses poverty, said Justin Weiss, activities coordinator for volunteer programs and services at the Matador Involvement Center. In Los Angeles, about 26 percent of families are living below the poverty line, according to statistics from city-data.com. That number rises to 47 percent when the family consists of a single mother. 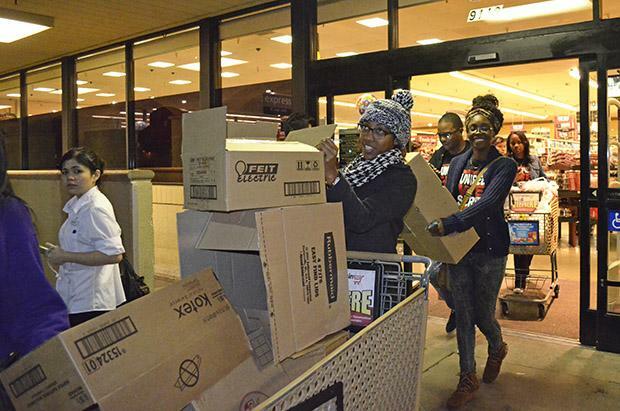 The members of UWS started their night at VONS supermarket after meeting in the G3 parking lot of CSUN at around 7 p.m. Once inside the grocery store, they split into two groups and tag-teamed the gathering of Thanksgiving items and other foods which consisted of a frozen turkey, canned goods, cereal, milk, cake mix, stuffing and others. Daisy Gonzalez, senior sociology and criminology major, has volunteered with UWS for two years. She enjoys both aspects of being involved with delivering Thanksgiving food to families in need. “It’s one experience when you’re shopping (for their dinner) because we get to be with our friends and interact (with) our group members, and then it’s a whole other experience when you go and drop off the food to the families because you get to see their reactions,” Garcia said. The next stop on the journey was Garcia’s house, located about 10 minutes from the school. The volunteers arrived shortly after 9 p.m., and were greeted by Garcia and her youngest son at the gate. After everyone filed inside the home, Garcia was surprised at the amount of goods placed on her dining-room table. Following an exchange of thank-yous and a group picture, the eight UWS members, Garcia and her son gave each other a large group hug. 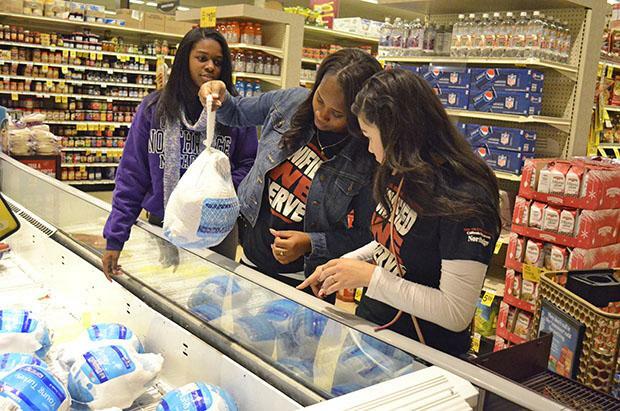 Travis White, junior criminology major and student assistant for UWS, has delivered Thanksgiving food for families for three years and enjoys the families’ reactions when the volunteers show up on their doorsteps. “Just seeing the excitement on their faces for the holidays makes me feel really great,” White said. White finds this experience different than when he worked with MEND assessing a family’s level of need. In addition to the money they raised to pay for the Thanksgiving food for Garcia and her children, the group also bought and donated a gift card from Target. “A lot of years we’ve done (the dinner delivery), we’ve always tried to go above and beyond,” White said. Participating in this deed reminds White of what he loves about the Thanksgiving holiday. Gonzalez mentioned the happiness on Caraveo’s face when he saw the boxes of food as an example of the positives that can come from this experience. Garcia was glad she could provide the kind of Thanksgiving that she feels her children should have. With the feast provided by UWS, Garcia said she will now attempt to celebrate Thanksgiving with her family and those living in the house. On a typical Wednesday afternoon, Steven Stepanek was in his office at the Computer Science department when he received a not-so-typical phone call. It was Jerry Brown, governor of California. The two talked for about 10 minutes about the status of higher education in the state, but Stepanek was hit with a surprise when they finished talking. On Oct. 23, Stepanek was named a faculty member of the CSU Board of Trustees and the first CSUN professor to be given that position. The faculty trustee position is a two-year term of office, but Stepanek will serve six fewer months due to Brown not making his appointment back in May, when the position is normally filled. After months of waiting, Stepanek was glad when Brown finally chose a candidate. Stepanek also applied for the trustee position three years ago. During that time, he was also among the final two candidates, but was not selected. “I initially debated a little bit with myself, ‘Do I want to put my name up again or not?’ I decided, why not?” Stepanek said. Stepanek is currently chair of the Computer Science Department and faculty president of CSUN. He has been part of the university in some fashion for about 40 years, starting as an undergraduate mathematics major before eventually becoming a professor and advancing to his current positions. “I’ve kind of seen many of these different angles of CSUN over this particular period of time,” Stepanek said. Stepenak will have to step down from his duties as department chair and faculty president in order to devote all of his time to the board. Talar Alexanian, journalism major, was appointed to the Board of Trustees in September of this year as a student trustee. Alexanian and Stepanek are the first CSUN student-faculty tandem to be appointed to the board. “In its own way, it says something about Northridge, both in terms of what we’re doing for faculty development and for what we’re doing for the students also,” Stepanek said. Stepanek recently attended his first BOT meeting, something he had not done in person yet. He said he listened to audio of the meetings while doing other tasks in the past. Harold Hellenbrand, provost and vice president for academic affairs, felt that Brown’s appointment of Stepanek to the board was appropriate. Hellenbrand feels Stepanek will have his work cut for him with the other board members. Hellenbrand also said Stepanek’s personality will do him good in terms of working with his new colleagues. After 40 years of service to the university, Stepanek said retirement is one of many options going forward, but he is keeping his future open-ended for the time being. In the catacombs of Cypress Hall, surrounded by practice rooms in which budding musicians can be heard honing their crafts, lies room 150. It looks much like other rooms in the building from the outside. But inside, July Berghofer helps run the Music Therapy Wellness Clinic, using music to help patients suffering from various types of disabilities. “I just think because music is so innate in all of us — it’s something that we’ve got that we already have in our bodies, spirit and memories — that we, as clinicians, know what it is that we can draw from people and connect with people through music of any culture, of any age, without words,” said Berghofer, assistant director of the clinic. The clinic was started in 1996 and works with a wide spectrum of diagnoses including autism, stroke victims, down syndrome, cognitive impairments and others, as well as teens struggling with mental health issues or substance abuse, according to Berghofer. The majority of her patients are unable to verbally communicate, and range from age two to 85. One of Berghofer’s patients, who wished to remain anonymous, suffers from a rare genetic condition which has left her confined to a wheelchair and unable to communicate. Berghofer has been working with the patient since 2006. During a recent therapy session, Berghofer and Scott Whelan, junior music therapy major, played and sang songs on guitar and piano in an effort to get the patient to sing along. The patient was also encouraged to tap a beat on a tambourine and a kick drum pedal. Kelly Dempster has been the patient’s nurse for two and a half years, and feels her work with Berghofer has yielded positive results. Dempster also feels the therapy has brought about unexpected results for the patient. The wellness clinic costs $37.50 per 25-minute individual session, $57.50 per 45-minute individual session and $37.50 per 45-minute group, according to the clinic’s website. Berghofer said the services of the clinic are not covered by insurance. As part of the music therapy major, students take part in sessions with Berghofer and other therapists in one of four field work opportunities during their studies. On Tuesdays and Thursdays, students learn psychology of music, research techniques and familiarize themselves with different populations such as patients in hospice, the hearing impaired, geriatrics and others. Whelan became interested in the field while working at a program for adults with disabilities and realized he wanted to merge those two passions. Whelan is in his first year of field work and assists Berghofer with her patients. He shares her belief in music’s ability to heal. The music therapy program also offers two choirs for patients, one of which is called the Sunshine Singers. It started two years ago and patients are not required to audition. “It’s become a really good social outlet for these young people [and] it’s run in a way where they have quite a lot of autonomy,” Berghofer said. Berghofer said that each patient has an individual goal depending on their diagnosis. However, the program does have an overall goal. “It’s really just trying to help them to see the strengths and to reach the potential as much as we can,” Berghofer said. 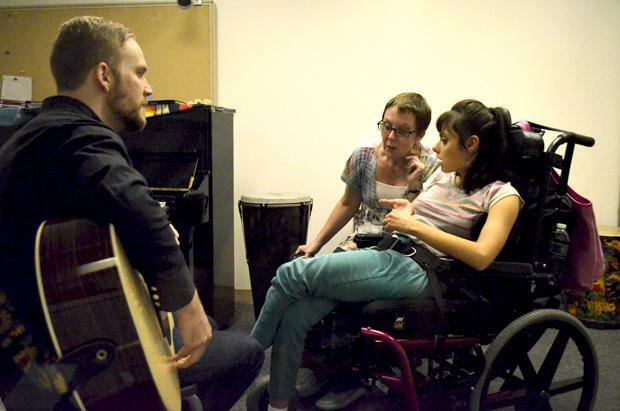 Whelan feels there can be goals for the patients of the music therapy clinic. The CSUN Matadors (1-2) got blitzed by a 14-2 scoring run to end the first half and fell to the Fresno State Bulldogs (2-1) in blowout fashion, 80-64. Points in the paint were a problem again for CSUN as they gave up 44 to FSU while only scoring 30. 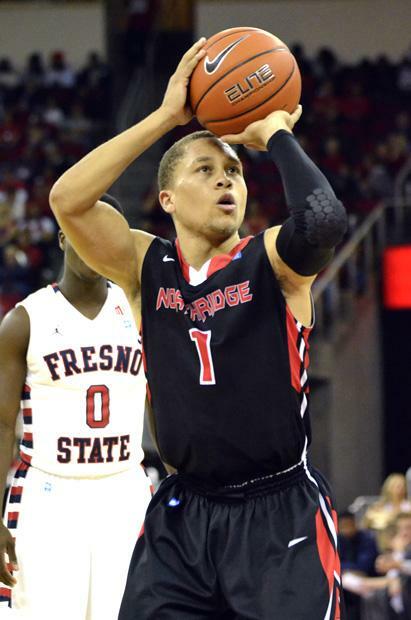 The Bulldogs shot 55.4 percent for the game to the Matadors’ 44.6 percent. Senior guard Josh Greene scored a team-high 17 points and made 3-5 shots from beyond the arc. Senior guard Tyler Johnson led Fresno state with a double-double of 18 points and 12 rebounds. After a close first few minutes of the game, CSUN found themselves down two with 8:36 to go in the first half, but gave up seven straight points — five coming from the free throw line — for a 27-18 deficit. After two free throws by freshman guard Aaron Parks pulled the Matadors within two yet again, the Bulldogs answered with a 10-0 run and ended the half with a 41-27 lead. Greene scored five of his 15 second-half points in the first minute of the second stanza, and cut the Fresno State lead to nine. “I’m going to keep playing hard regardless of whether we’re up 50 or down 50, it doesn’t matter,” Greene said. But FSU exploded with a 15-4 run to increase their lead to 20. CSUN did not get closer than 15 in the half, and never led in the game. Greene said the large first-half scoring run by the Bulldogs was a result of poor Matador shot selection and transition defense. CSUN was outrebounded by FSU 36-24, a disparity Greene thought was every player’s responsibility. Head coach Reggie Theus thought the game was a perfect storm of poor overall play. “If you’re not going to rebound, if you’re not going to get to the line, and you’re shooting poorly, that’s a bad combination of things,” Theus said. CSUN scored only seven fast break points to FSU’s 19. Theus felt his team played out of character. Theus also said the team has lost the last two games because of a lack of physical toughness. Even though the Matadors are on a two-game losing streak, Theus feels the team can learn from the losses. “I hope that these two games give us what we need to understand what we have to do to win,” Theus said.